9Mobile is out with a Free 200MB Data for all subscribers that would carry simple task , this isn't a cheat or a trick , it is officially powered by 9mobile . 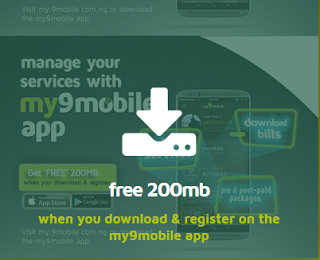 I guess most of you must still be flexing the 9Mobile free YouTube Night data , this might still be of great help to many 9mobile users out there , you get 200MB free data when you download and register the 9Mobile app . ➽ Register and fill out all the required details. ➽ After that, tap on the submit . ➽ You will get a confirmation code on the number you used as a part of enrolling. ➽ Copy the confirmation code and paste it in the given box on the site. ➽ Just tap on submit to finish . Note: It may take around 24hours for you to receive your data. Dial *228# to check the information adjust. I noticed something in your blog that you no longer accept my comment because I usually post almost every day and I don't usually see them here,and if you no longer value my comment on your blog old let me know so that I can stop.